Either Craft, Bangra or Line Dancing – TBC! The Changing Face Of Hackney Laurie Elks will be talking about the book he edited on behalf of ‘The Hackney Society’ exploring how Hackney has changed over the last 50 years. Laurie is a trustee of the Hackney Society and Hackney Historic Buildings Trust and a custodian of St Augustine’s Tower, the borough’s oldest building. Fruit Farming Sarah Calcutt is one of a handful of female fruit farmers in the UK. She is the manager of a cooperative of 21 fruit farms, in 7 counties. Fruit farming in the UK is a marginally profitable enterprise if you are a good grower, small farms are under threat and Sarah’s role is to provide cross group support and investment in technology to improve profitability. Sarah is also the first female chair of the fruit industry’s 85 year old charity. They represent 85% of the UK’s fruit growers with a series of annual events designed to showcase the fruit they grow. Sarah plans to bring some home grown fruit for us to sample as well. Pottery workshop Marie-Claire will demonstrate how to throw a pot. She will show us how to produce a coil pot, which, during the evening we can have a go at making ourselves. Marie-Claire began making ceramics in 2014. Trained as a medical doctor and working in the field of neurology, she was drawn to creating pieces that are both practical and artistic. Osteopathy for Heath Sundip Balraj Singh-Aujla, a registered osteopath will talk about women’s health, the importance of correct posture and how to maintain a healthy pain free posture, the importance of yoga and Pilates in pelvic and spinal stability and the role of osteopathy as a primary healthcare in health maintenance and injury prevention. Tea and Cake It’s our 4th Birthday and Annual General Meeting when we look back at everything we’ve done over the past year and plan for new adventures ahead. Plus there will be birthday cake, tea, wine and lots of chat! David Buckman recounts the lost history of the ‘East London Group’. One of the major artistic movements to come out of the East End in the last century, this group created many innovative and evocative paintings of the East End in the 1920s and 30s. Eleanor Bloom of London at Your feet talks about 18th Century London when the society thrived on the black economy, depravity and debauchery. Summer social meeting in a local pub or picnic. Venue TBC. Award winning comedian, journalist and actress Samantha Baines will be coming to do her latest stand up show about amazing women who have been ignored by the history books. Please join us for a few laughs. It’s our AGM where we will be deciding our new committee plus voting on which resolutions the NFWI will be taking forward. Belly Dancing with teacher and performer Yvette Cowles. Come and learn about the origins and history of belly dance, the health benefits, have a demonstration and then have a go! Huguenot Society Presentation. Glynda Easterbrook is a recent president of the Huguenot Society of Great Britain and will be talking about their history in the UK, particularly in the East End of London. Learn to mono print with AfroRetro. You will learn how to design your own mood board, mono-print and get your own design printed onto paper or fabric. Ugandan and English inspired fusion brand AfroRetro specialise in making fashion, accessories, jewellery and gifts. Local designer Ella Doran will be discussing incorporating the “circular economy”, recycle and reuse, into her business. She will also lead us on a paper bag workshop. HULA HOOPING! The Majorettes are a World Record Holding Troupe of hula hoop extraodinaires. Coached and led by circus super star Marawa The Amazing, these girls have hooped all over the world wowing audiences with their impressive tricks, beautiful formations and fun loving style. Exercising doesn’t have to be a drag – in our hula hoop classes learn new tricks, exercise in a fun way and get ABS HARDER THAN DIAMONDS! They will provide hoops – and attendees should wear comfortable sports clothes (no jeans or jumpers). Just in time for Valentines craft perfumier Sarah Mc Cartney will be coming to speak to us about her hand made microperfumery 4160tuesdays. The wonderful singer and choir leader at St. Peter’s, Barbara Hoefling, has agreed to teach us the rudiments of singing. Can we learn to sing in tune? Let’s hope so because by the end of the meeting we want to be able to sing a group version of ‘Jerusalem’ by the end of our meeting. Its our AGM plus an opportunity for some adult colouring – we’ve been given some books to test drive our colouring skills. Now is the time to start thinking of resolutions we want to propose for voting in 2017 – thinking caps on! WAKE UP and smell the oils – the art and science of aromatherapy by complementary therapist Jane Williams. From amyris to ylang ylang essential oils can change mood and behaviour, relieve emotional and physical pain, stimulate memory and help counteract the stresses and strains of daily life. During my talk you’ll have the opportunity to smell and taste an array of gorgeous oils and resins as well as some of the plants and flowers they’re derived from. You’ll learn about the oils’ therapeutic properties, look at different ways you can use them effectively and safely; for bathing, in massage and inhalation; for scenting a room; in cooking and above all to promote happiness and well-being. Jane is a long-time de Beauvoir resident. She is a complementary therapist and Iyengar yoga teacher. Jane works at University College Hospital using her aromatherapy and massage skills to help cancer patients of all ages and their families. In her private practice Jane offers craniosacral therapy, myofasial release and postural bodywork. She is currently doing a practitioner training in applied mindfulness with the aim of using it in a therapeutic context in her work and everyday life. Ben Mackinnon describes how he founded artisan bakery E5 Bakehouse, in the corner of a railway arch in London Fields in 2011. The bakery has enjoyed huge success and the popularity of sourdough bread has spread but although he now employs 46 people he still runs the business along strong sustainable and ethical principals. Not least deliveries – which are only by bicycle – limiting them to Hackney restaurants and delis. Fashion in the 60s: fashion Designer Linda Warren studied fashion at Medway College of Art Rochester. Taught by Dame Zandra Rhodes’s mother she went on to have a 50-year career in fashion. Lulu wore her clothes in the sixties and it was not unusual for Rod Stewart to sing in the college refectory. The talk spans the 60s early 70s. Alex Nunn, from Action for Happiness, leads us in an inspiring and interactive exploration of what really matters for a happy and meaningful life. We’ve had a sneak peek, and two of the keys are connecting with others and learning new things. So come join us on Thursday. 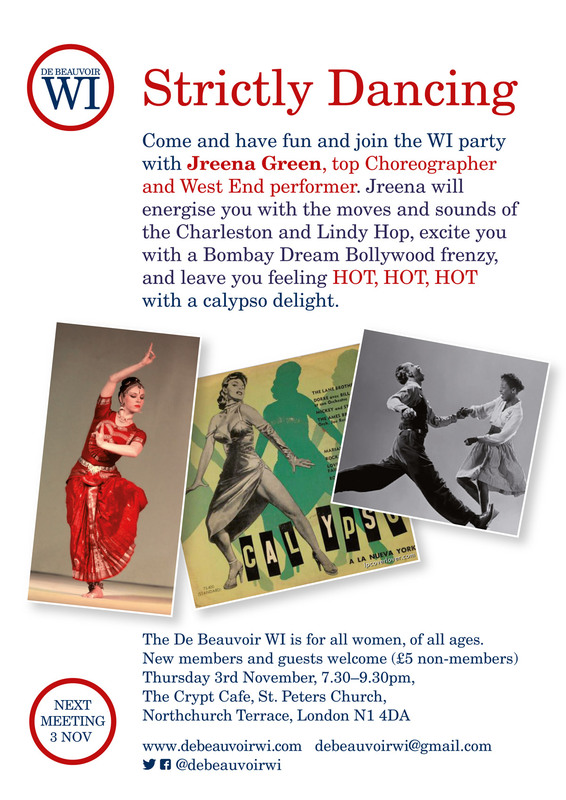 A special group meeting of WIs hosted by De Beauvoir WI. The evening is a themed Bollywood evening. Learn a little more about what it’s like to live with dementia and how you can make a difference and help to create a dementia friendly community. Everyone who attends will become a ‘Dementia Friend’ and get a badge, and learn now to turn your understanding into action. The January meeting is a body-confidence workshop by Delores Deluxe, a well-known performer and teacher of burlesque. Delores will ask us to look at the way we see ourselves and challenge how we feel about our bodies. Whatever your size or shape, don’t be shy: come along and be beautiful! Dolores promises a ‘burlesque twist’ to the evening! We’re delighted to announce that one of the curators from the School of Historical Dress will be coming to give us a talk about the history of what we wear. The School, whose patrons include Sir Roy Strong, Vivienne Westwood and the actor Mark Rylance, is right on our doorstep, in Charles Square in Islington and, as its motto says, it’s about “Everything Anyone Ever Wore”. Joseph Markovitch was born next to Old Street roundabout in 1927 and lived in Hoxton all his life – he left only once, to visit the seaside with his mother. Local photographer Martin Usborne took some wonderful pictures of Joseph and made them into a book called I’ve Lived in East London for 85½ Years, published by Hoxton Mini Press. Martin will be talking about Joseph and the book, and about his work in general. Martin has published a number of other books, and his work has appeared in magazines and shows around the world, as well as at the National Portrait Gallery. Naomi Wynter-Vincent is the founder of the London Rolfing Clinic, based in Bloomsbury, and a certified Rolfer™, yoga teacher and massage therapist. One of only 34 Rolfers in the UK, she took the decision to change her life completely after years spent unhappily sitting in offices amid debilitating episodes of chronic fatigue, severe anxiety and joint pain. This is what she says about Rolfing… a form of bodywork that brings about noticeable and lasting improvements in posture, flexibility and overall health, including a reduction in back and shoulder pain and the resolution of old injuries, along with noticeable cosmetic shifts, such as standing taller and looking slimmer. It is named after its founder, Dr Ida Rolf, a U.S. research scientist and bodywork pioneer who lived from 1896-1979. Her insights have been confirmed by scientific research into the role of fascial tissue, the nervous system and the effect of gravity on the body. Rolfing aims to transform your alignment so that your usual stress patterns (seen commonly in aching shoulders, tight hamstrings, painful knees and stiff ankles) are resolved completely or substantially improved over ten sessions. 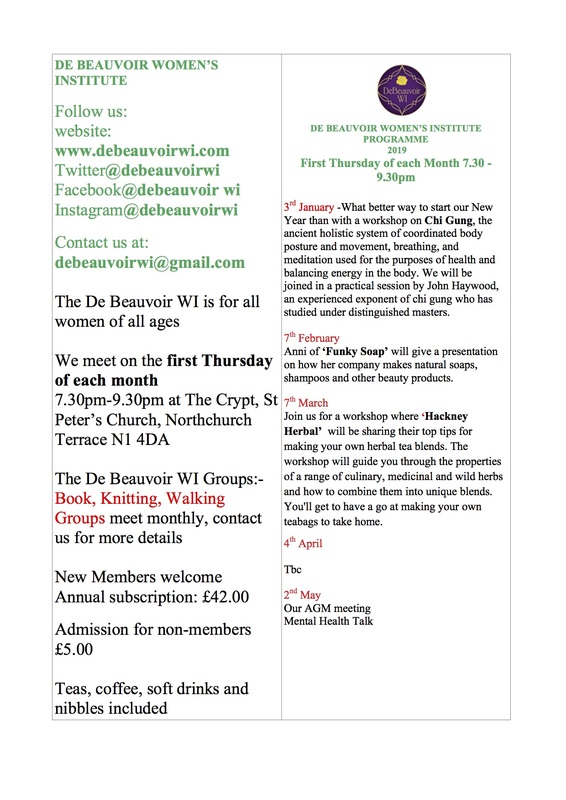 Its principles of good posture and greater awareness are easy to learn and incorporate into everyday life, so come along to De Beauvoir WI in April to learn more about Rolfing and how even make small adjustments to how you stand and sit can bring about lasting changes to your energy levels, self-confidence and overall health. Its our AGM plus wine, tea, nibbles, chat and entertainment. Fantastic Felt: needle-felting workshop with Sue Pearl of Felt Better. Happy Hundredth WI! Centenary celebration with other local WIs, plus talk by Jane Robinson, author of A force to be reckoned with: The History of the WI. (Also this month we are manning the cake stall at The Party in the Park on July 11th – bakers and volunteers needed). Informal summer get-together – picnic in a neighbourhood park or meet in the local pub depending on the weather. 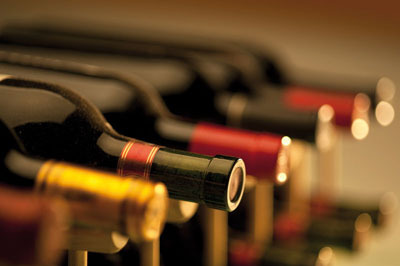 Back by popular demand – wine tasting with Julie Campbell of Vinvixen our local independant wine shop. Please note guest admission is £10 for this meeting. Beekeeping with local beekeeper Richard Turnbull. Talk by Meg Hillier, MP for Hackney South and Shoreditch. Christmas crafts and jewellery making. We’re delighted to say that Esther Kate Booth from the Roasting Shed has agreed to come along and explain the coffee-roasting process, with tasters of her different coffees for us to try. The Roasting Shed is a fabulous micro-roastery in Clapton, whose motto is “Life’s too short to drink bad coffee”. The evening is a must for all you caffeine addicts, though as usual there’ll also be tea and wine (provided by our very own Julie Campbell from Vinvixen), as well as another chance to meet, greet, chat and put forward your ideas for building the DBWI. A sit-and-sew session at which we’ll be making our own DBWI banner. We’ll be asking people to bring along fabric remnants or bits of old clothing that can be ‘upcycled’ into beautiful panels for our own lovely banner. Any keen sewers out there, please come forward with your ideas for our design. And don’t worry if sewing isn’t particularly your thing – come and chat, help to cut fabric or just provide encouragement. This meeting falls in the middle of the summer holidays so we are saving on renting the crypt and just having an informal social evening instead. Meet at The De Beauvoir Arms at 7.30pm for a catch up. We have a real treat in store for our next meeting at the crypt: Chocolate Tasting with Niko B. Organic Chocolates founder Anthony Ferguson. Local chocolatier Anthony will teach us all about his craft and best of all – we get to taste his wares and compare and rate his chocolate! We are very pleased to announce that Edward Benyon will be the speaker at the October meeting. He will be talking about the fascinating history of our very own de Beauvoir town and his family’s involvement and plans for this fascinating corner of London. This will be a fun crafting workshop where we can all try our hand at learning the art of decoupage. We will supply materials but you should bring a small pair of sharp scissors with you. The idea is that we make some items to sell on our stall at the christmas fair. It will be run in small groups so that we can also get a chance to mingle and meet. To get us into the party season mood DBWI member Julie Campbell of Vinvixen on Kingsland Road is hosting a wine tasting evening for us. Julie supplies the wine for our monthly meetings which is always delicious and she will share her knowledge with us and help us put a christmas wine wish list together. Wine not your thing? There will also be non-alcoholic punch to enjoy, as well as the usual tea, coffee, raffle & conversation.